“Bochka” restauranand and Glenmorangie whiskey present a gastronomic journey with Gennady Yozefavichus. 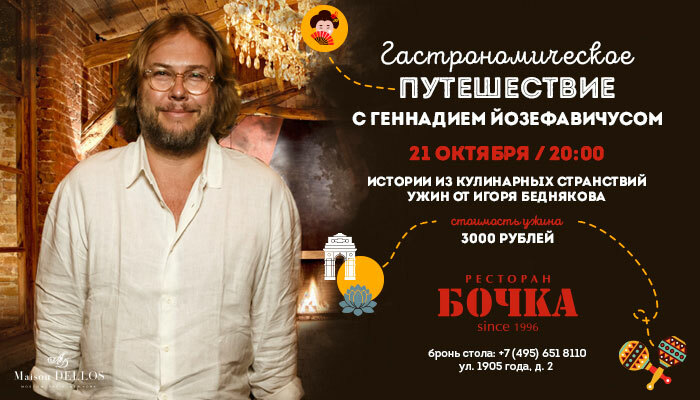 At night, October 21 , Igor Begnyakov, chef of the restaurant «Bochka» and Conde Nast Traveller newsperson, Gennady Iozefavichus join together to dine the guests with «from top to toe» style meat meal and culinary stories from around the world. From his trips, Gennady always brings not only stories and experiences, but also spices. From Kashmir, Taiwan, Sicily islands and Japan, he brought the precious saffron and an unusual small garlic, pepper Shichimi, black sesame, shavings of dried bonito tuna, and even Sicilian salt from Marsala. Using all those ingredients, Igor Bednyakov will cook different parts of the calf: tongue, liver, tenderloin, ribs and tail. As a side dish – Yorkshire pudding, risotto and Gennady stories about the places where those rare species came from, about gastronomic traditions of the countries where the author of hundreds of articles traveled, about his encounters with the great chefs. Glenmorangie is another full-fledged actor during this gastronomic evening. Favorite single malt Scotch whiskey from the beginning of the 80s with a high quality and balanced taste. In the evening, guests may not only enjoy the whiskey – they can taste this noble drink in one of the dishes prepared by Igor Bednyakov. ∙ panna cotta with saffron from Kashmir. Set price for 6 servings – 3000 rubles.